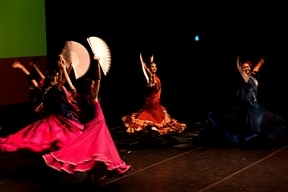 Chicago Music and Dance International, Inc. has announced that more than 20 dance groups, including 13 different ethnic dance groups, will participate in this year’s third annual 2014 World Dance Day. The event is scheduled for 3 p.m. Sunday, April 27, 2014, at the Auditorium at Northeastern Illinois University, 5500 N. St. Louis Ave., Chicago, IL 60625. Tickets for 2014 World Dance Day are $20 for adults and $10 for seniors, children and students with identification and are available at the door or by calling 773-463-1619. Headed by artistic director Altin Naska, 2014 World Dance Day is a celebration of movement, expression and culture that features professional dancers as well as elite dance students from some of Chicago’s top dance organizations. The event is held in honor of International World Dance Day, an annual occurrence which was introduced in 1982 by the International Dance Committee of the UNESCO International Theatre Institute.